Before we say a word to visitors, we have told them what our church means to us by the way we care for it. Many people say how much they appreciate the welcoming warmth and brightness of St James's. This is achieved in various ways. This has the responsibility to the Parochial Church Council for the maintenance, upkeep and care of the church, the hall, the vicarage, the garage, the shed and all other structures, but not the moveable items which are the legal responsibility of the churchwardens. The churchyard is maintained by the London Borough of Richmond upon Thames, overseen by the committee, but their care is pretty basic. There are innumerable works of maintenance, repair, renovation and sometimes construction which need to be done. These are tackled as they arise, often by team members themselves. Although some of the team have professional skills, some major work requires outside assistance. The team will assess the work required, obtain estimates and make recommendations to the PCC. An important maintenance activity undertaken by the Properties team in the autumn is the annual leaf sweep and gutter clean. All gutters of both the church and the hall are cleared of leaves that have built up over the year after which the gutters and drain pipes are flushed through to ensure the free passage of water. The courtyard and cark park are also swept of leaves. Volunteers are drafted in to help with this necessary work. The diocese requires and pays for an architect to carry out a quinquennial (five-yearly) inspection of our church property and fabric. The funding and carrying out any maintenance work required by the architect is our responsibility. • Church and hall fire extinguisher equipment. • Hall fire alarm system. • Church and hall boilers and heating system. • Church and hall portable electrical equipment. • Church lightning protection system. • Church clock and bells. During 2017 there were major works on the church building. Two toilets were installed in the west porch, and the glass exterior doors were replaced. Cupboards for Fairtrade stock were created in the hall. The vestry furniture was upgraded, and storage rationalised. The heating was examined and remedial works done to improve the warmth of the church. Further remedial work was required on the AV installation. The clock dial was restored and refitted into the tower and at the same time repairs were undertaken to the stonework. The organ renovation began and continued into 2018. The Quinquennial Inspection was conducted and the team implemented its recommendations. There are regular weekly cleaning tasks undertaken by volunteers. This involves sweeping the wood and tiled floors and hoovering the carpet; polishing the brass (candlesticks, cross, wall plaques); running a duster over the pews and choir stalls, and tidying the kneelers and chairs. All the cleaning equipment needed is kept in the vestry porch. The altar linen is washed and ironed by a member of the congregation and the choir robes are looked after by a member of the choir. Together with the other disciplines of Lent, the annual cleaning of our church building is a preparation for Easter. This is a grand session of very thorough 'spring cleaning' carried out by a group of volunteers who do a 'mass attack'. This lasts several days and absolutely everything is cleaned, scrubbed and polished. The high-level areas, roof trusses, window ledges, column caps and chandeliers are dusted. 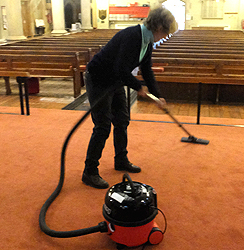 The chairs are dusted, the pews polished, the floors are washed and sealed and the carpets hoovered. This dusting and sweeping includes the vestry, the porches, the belfry and the clock chamber. All this work needs helpers! More volunteers are always very welcome.